Paving in Perth may require more technical expertise than you think, this is because there are more factors to consider when installing pavers than you think. These factors include the drainage system and the presence of soak wells underneath the establishments in Perth. Fortunately, there are paving contractors that specialise in this area and are located in Perth. They follow an almost similar process done, which has been perfected over time. Perth-based contracting companies usually discuss this process with their clients on their first site visit. Planning and layout is the first stage of the process. This is commonly done on the same day your paving contractor visits the site for the first time. The representatives of the contracting company will ask you about your plan and desired output. At this stage, you probably have an idea of what you want your paving to look like. This is also the stage where the paving contractor will measure the area, check if the drainage and soak wells will be affected, and draw the outline of the project according to your specifications. The layout may be adjusted several times until the both of you come into agreement. Once you and your paving contractor have agreed to one plan, the contractor will now calculate the number of pavers needed to pave the area. The calculated number of pavers is usually increased by five to ten percent to provide allowances for curves and odd spaces. Some contractors can calculate a fixed cost for the whole project prior to the actual paving. Perth-based homeowners, however, are advised to confirm if there are no hidden charges before signing a contract with the contractor. Meanwhile, most of the paving services only provide cost estimation before the project begins. Paving Services Perth : Email or Phone Killian. After calculation of materials, the land on the area shall then be excavated according to the pre-calculated depth, width, and length. This is an important step to provide space for the foundation of the paving. Perth-based contractors shall apply proper measures to ensure that there will be enough space underneath to allow water drainage. After excavation, the contracting team will then lay the base material. The base material is typically made up of crushed rock. The thickness of base material shall follow the outlined plan to ensure that it will be suitable for the sub-base. When the required thickness is achieved, the team shall compact the base. Once the base material is compacted, the contracting team shall install edge restraints made of wood, plastic, metal, or concrete. These restraints are important to secure your pavers in place one they are installed. Afterwards, the contracting team will lay down the sub-base material. This will serve as the bedding to support the paving. Perth landscaping contractors generally encourage the use of sand as bedding. After the bedding is set, pavers will then be laid in accordance with the specified pattern of paving. Perth-based contractors use specific types of materials that can withstand Perth’s weather conditions. These materials include travertine, granite, limestone, and brick. Travertine pavers are great for pool paving as they have a non-slip surface. They can withstand freezing and erosion. They are easy to maintain plus; their colours do not fade. Granite pavers are mainly used for aesthetics. However, they are also known for their durability. They are scratch- and slip-resistant. Since granite is non-combustible, granite pavers are also heat resistant. Limestone pavers are best for patio and driveway areas. They can hold heavy foot traffic with their durability. Limestone pavers naturally have varying colours as they come from the ocean seabed. This colour variation adds up to their aesthetic effect. Brick pavers are made of clay. They have a non-slip surface and long-lasting colour. Brick pavers are often labelled as practical pavers as they are easy to install and are low-maintenance. Regardless of the materials used, all the pavers laid shall be set into the bedding using a mechanical plate compactor. After paving, the contracting team will need to seal the pavers to prevent movement and separation. They will start by filling the narrow spaces between the pavers (called joints) with sand. Finely grained sand is more preferable than coarse sand when it comes to filling joints. Once all the joints are filled with sand, the team will sweep any excess to prepare the pavement for sealing. They will then use a sand binding sealant to secure all joints in the paving. 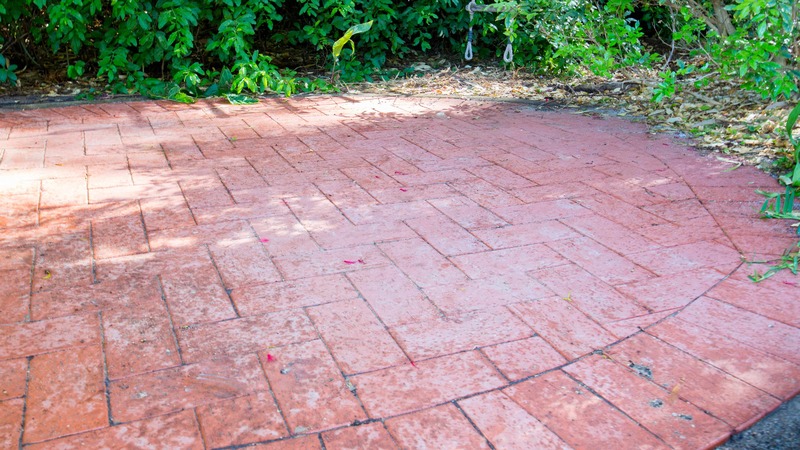 Perth-based paving contractors also use sealant to prevent stains and growth of vegetation between pavers. When your pavement is properly installed, rest assured that it will not need costly maintenance. It will be able to withstand both wet and dry conditions. Regular sweeping, however, may be required to maintain a clean look. If you are looking for a paving contractor that will explain the whole process to you detail by detail, WA Luxury Landscaping is just one call away! Killian and his team will not just pave your yard, they will be there to guide you through each stage of transforming it!